You have seen it on the news…yet another state has legalized marijuana. It seems as if weed is everywhere, surely Texas has jumped on the bandwagon and legalized it too! Our firm receives calls from people all the time who all say the same thing; they thought marijuana was legal now. Not in Texas. Despite having been legalized in other states, possessing even a small amount of marijuana is a crime in Texas. The Texas Health and Safety Code says it is illegal for a person to knowingly or intentionally possess a usable quantity of marijuana. How much marijuana a person has in their possession will affect the level of severity of the offense. Texas failed to pass any new marijuana legislation in 2017, but proponents of legalized marijuana are hopeful for the 2019 legislative session. House Bill 2107 was proposed during the 2017 session, co-authored by 78 House members. The bill would have expanded the Compassionate Use Act to include Texans dealing with medical issues other than intractable epilepsy. While the bill narrowly missed being brought to a vote, it showed there was bipartisan support for such a bill, and legislators remain optimistic marijuana reform will happen in 2019. The Texas Compassionate Use Act was signed by Governor Greg Abbot in 2015. The Act allows for individuals with intractable epilepsy to have access to CBD oil, a low THC cannabis oil. The bill prohibits smoking marijuana. Critics of the law say it is unworkable, as it requires a doctor to “prescribe” marijuana rather than recommend it as they do in other states where medical marijuana is legal. Under current federal law, a doctor “prescribing” marijuana could be open to sanctions, while one recommending the use is not. Another issue is that the ratio of THC to CBD that is allowed under the law is not potent enough to help some patients. There is potential for changes to be made to the Act during this legislative session, with proponents of the Act looking to broaden the scope and make access easier for patients. 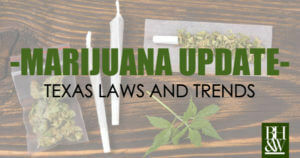 Possessing THC (tetrahydrocannabinol) oil in Texas is considered a more serious crime than simply possessing marijuana. Over the last few years, vaping THC oil, which is a concentrated version of the mind-altering component of marijuana, has become popular. Under Texas law, THC oil or wax is considered a concentrate and possessing it is a felony criminal offense. The law considers THC oil and wax to be in a different penalty group that marijuana, due to the higher level of THC, and consequences are much harsher. So while a typical small amount of marijuana could be punishable as a misdemeanor, even a very small amount of THC oil can be punishable as a felony. This is a common misconception that we often see in our THC oil cases. The user believes that a low amount is a misdemeanor, much like a low amount of marijuana. Not so. Every THC oil case is a felony. The use of THC oil in edibles can be very serious. When weighing the amount of a controlled substance, the Texas Health and Safety Code includes all adulterants and dilutants in the total weight. Popular THC laced edibles like gummy candy and brownies will be weighed in their entirety, and can result in very serious felony charges. Cannabidiol oil (CBD Oil) is made from cannabis, but is non-psychoactive. CBD oil that is made from industrial hemp is currently legal in Texas. Recently, shops selling CBD oil products have been popping up all over the metroplex, with promises the product can relieve pain and anxiety. The Texas Department of State Health Services has begun to crack down on retailers selling food products made with CBD oil, claiming they have the power to regulate any food product that contains CBD oil. But not all CBD oil is legal. If there is any trace of THC in the CBD oil, the user could face prosecution for misdemeanor Possession of a Controlled Substance (Not in a Penalty Group). K2, or Spice, is a synthetic form of marijuana that is created by spraying natural herbs with chemicals meant to mimic the effects of marijuana. Synthetic Marijuana is illegal in Texas, and carries the same punishment as marijuana. Several counties across the state, including Dallas, Bexar, and Harris, have implemented a marijuana cite and release program whereby folks are not being arrested for low-level possession charges. Other counties have diversion programs for first-time or low level offenders. You should check with a knowledgable attorney in your local area to learn more about the diversion programs available. In Tarrant County, depending on the circumstances of the case, a marijuana offender may qualify for the Deferred Prosecution Program (DPP) or the First Offender Drug Program (FODP). Again, you should check with an attorney to determine whether you might be eligible to participate in either program. Regardless of whether you disagree with what the law should be in regard to marijuana in Texas, it is currently illegal to use or possess. If you are arrested for possession of marijuana, you may qualify for a diversion program that will ultimately allow you to get your record fully expunged. Contact one of our attorneys today if you have pending marijuana charges in Tarrant County. We will be happy to discuss your options and defend your case.